Equinox devotees will gather every year for the Vernal Equinox. A place of sun worship still, Stonehenge is a mysterious destination that holds deep spiritual value for many travelers. Some researchers suggest the formation was erected as early as 2200 BC, while others argue it was even earlier, in 3000 BC. No matter the date of creation, Stonehenge is a powerful landmark, and well worth the visit for a beautiful—and perhaps magical—sunrise. The sun doesn’t set in Svalbard—at least not between mid-April and late August each year. It’s obvious, then, why the sun rising holds an almost magical appeal for visitors. Situated north of the Arctic Circle, the northernmost inhabited spot on the planet features the midnight sun, a phenomenon where the sun stays continuously in the sky for 24 hours a day. Glaciers and mountains clutter Svalbard’s horizon, painting a landscape that merely enhances the event. Angkor Wat any time of day is powerful, but arriving early enough to watch the sunrise offers visitors an even greater spectacle. The preserved temple attracts travelers to Cambodia from around the world, providing them architectural insight into Khmer and Hindu mythology and history. We advise that visitors dedicate more than a day to exploring the sacred grounds (and that one of those days begins before dawn). Smack dab on the 180-degree longitude line, Fiji is one of the first spots in the world to see the sun rise every day. The South Pacific destination, a favorite among lovers of turquoise seas and white-sand beaches (and who isn’t), offers unrivaled scenery and inspirational landscapes. Itinerary tip: Follow an intoxicating sunrise up with a morning exploration; the “soft coral capital of the world” offers some of the best scuba diving in the world. Climbing Mount Kilimanjaro is on practically every adventure traveler’s to-do list. With the enormous undertaking comes a chance to see one of the most enchanting sunrises in the world. From Kili’s summit—19,341 feet above sea level—dedicated souls can reflect on their ascent, a massive accomplishment, while soaking up an unparalleled sight to see. Boarding a bus in the wee hours of morning is a pain, particularly on vacation when the greatest indulgence is sleeping in. But the alarm-clock acknowledgement is worth it if the payoff is watching a sunrise from above the clouds, on the top of a volcano. Various van tours offer the trip through Haleakala National Park in Maui, picking visitors up at 3 a.m. and dropping them off to see the event from the summit. Should you want to (and we highly recommend it), you can bike the 28 miles down the mountain, back to sea level. A six-hour bus ride from Cuzco, the gateway to Machu Picchu, Tres Cruces is undeniably worth the long trek. The Incas held the mountain spot, situated on the Amazon basin, sacred. Nowadays, it’s visitors looking to experience a mind-blowing sunrise who sanctify the destination. The view famously boasts celestial hues and Polaroid moments from above the clouds. The coastal oasis of Tulum draws spiritual travelers and yoga-types year-round to soak up exquisite culture, history and scenery all in a single spot. The destination’s think-green mentality and efforts toward sustainability set the tone for a raw form of vacationing, where visitors are up with the sun (and often in bed shortly after the sun goes down). No need to set an alarm in Tulum, where sun worshipers gather at the shoreline daily to watch the sunrise. The most impressive sunrises in the continental United States occur every day across the Grand Canyon. Cool purples melt into shades bronze and orange against the awe-inspiring scenery, arguably America’s greatest natural wonder. There isn’t a best place to see the sunrise in the Grand Canyon, but Maricopa, Hopi, and Mather points, and along the South Rim are recommended highly by in-the-know travelers. First a history refresher: Jews, Christians and Muslims alike believe that Moses received the 10 Commandments at the biblical Mount Sinai, as mentioned in the Torah, Bible and Koran. Still an important religious destination, Mount Sinai today draws believers who scale the route by foot for religious purposes, and for the chance to see one of the most inspiring sunrises in the world. Broadly speaking the monument is made up of two stone types. Sarsens and Bluestones. While the large Sarsen stones come from the Marlborough Downs, about twenty miles from Stonehenge, the bluestones are not local. The Bluestones form two arrangements inside Stonehenge, a circle inside the outer sarsen circle and a horseshoe inside the trilithons. Originally there may have as many as eighty Bluestones, weighing up to five tons each. It’s difficult to be certain, some are missing, others are broken and the pattern of holes is confusing. The Bluestones have tended to be overshadowed by their larger neighbours. Early texts and examination of the stones show that Stonehenge is not the first site where the bluestones stood as a circle. Robert Graves said this sacred circle was transported to Stonehenge for it’s religious significance; in the words of Professor Rhys ‘ the stones were regarded as divine or as seats of divine power’. “The great dolmens of Stonehenge, all of local stone, look as thought they were erected to give importance to the smaller stones, which were placed in position shortly after they themselves were. It has been suggested that the smaller ones which are known to have been transported all the way from the Prescelly Mountains in Pembtokeshire, were originallt disposed in another order there and rearranged by the people who erected the larger ones.” – Robert Graves; The White Goddess, p282. 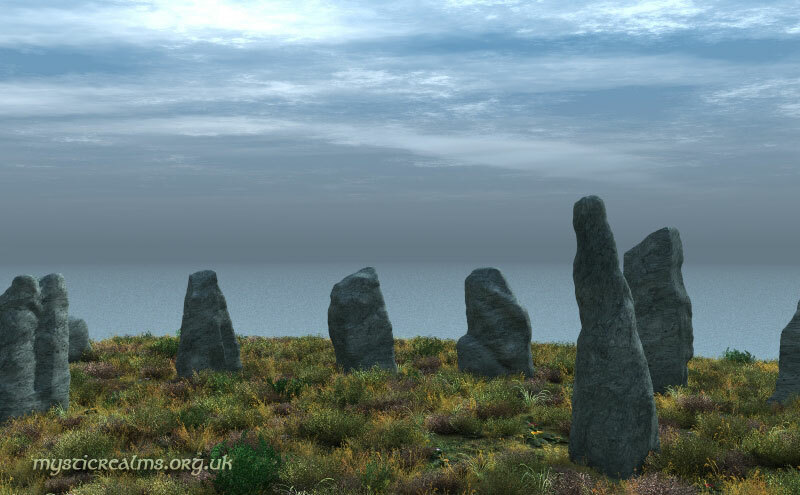 An existing sacred circle, whose stones originated in West Wales, was transported to Salisbury Plain, re-erected at Stonehenge and a mirror structure of local stone was erected around it. Until the advent of the railways transport by water was the only way to effectively move large heavy objects over long distances. Thus it is likely that much of the transportation of the bluestones from the Preseli Mtns. to Stonehenge was by water. First by river, then along/across the Bristol Channel/Severn Estuary, then lastly by river to Stonehenge; and while we can’t be certain which rivers were used we can be certain that in their passage across the Bristol Channel/Severn Estuary the bluestones would have been carried past Lundy Island. 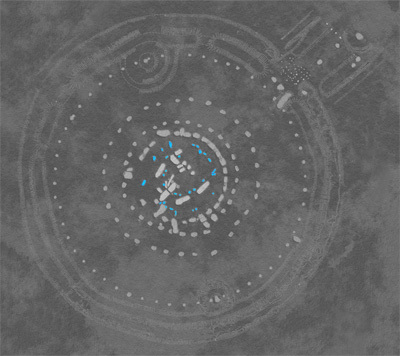 So, where did the bluestone circle first stand? Geoffrey claimed to have taken much of his information from an earlier British source, unknown to us today. Before Geoffrey the Scots lived in present day Ireland, the Irish were settled in areas of Cornwall, North Devon and the south-western part of present day Wales. Killaraus is unfortunately not identifiable. Stonehenge bluestones, in their incarnation as ‘The Giants Dance’ had their home somewhere in those areas of southwest Britain settled at one time by the Irish. Somewhere in Cornwall, North Devon Southwest Wales there’s a very sacred site without a stone circle. A search for a lack of stones doesn’t seem likely to be very productive. Megalithic stone circles have one common quality. The stones which make up the circle are aligned on natural features. If we take an imaginary stone circle monument. It possesses a number of stones standing in the landscape and certain stones line up with a distant natural feature, a mountain for instance. On midsummers day the solstice sun rises over that mountain. The stone alignment marks the midsummer solstice. Midsummer day + stones + natural feature + sun = sacred site. Midsummer day + natural feature +sunrise = Sacred site. Remembering what Geoffrey of Monmouth said about the stones ‘They are stones of a vast magnitude and wonderful quality’ and ‘They are mystical stones, and of a great medicinal virtue.’and considering the physical effort involved in manhandling over 80 stones weighing up to five tons each to Stonehenge alone testifies to the fact that the previous home of the Bluestones must have been a very special place, a holy place, to contain such an illustrious circle. Never mind the work in constructing the Sarsen stones around them. It seems probable that their earlier home was a site with several significant natural alignments. We go back in time to rediscover the true spirit of Druidism. Stonehenge has special significance to DruiInside Out takes a look inside the secret world of the Druids. We go back in time to rediscover the true spirit of DruidismTo most of us the Druids conjure up images of a mysterious, religious sect wearing strange robes and conducting archaic ceremonies out in the open air. The problem is that they’re a secretive bunch. They don’t write down their ideas nor do they have a Holy Book. Inside Out met a family whose mum became a Druid and looks at how it changed her and her familiy’s lives. Zoe Brice know better than anyone about having a Druid in the family. Zoe is 28 years old, and by day she works as a housing officer for a local council. She and her half brother and sister were brought up by her dad after her mum walked out on the family and became a traveller. Twenty years later her mum, Denny Price, is the archdruidess of the Glastonbury order of druids. It’s taken Zoe a long time to understand her mum’s actions and learn about her beliefs. To fully understand Druidism, you need to immerse yourself in ancient history, fantasy, myth and mystery. The lineage of the Druid spiritual tradition can be traced back many thousands of years. The origins of the Druids were as important religious figures among the Celts, who came to Britain in 1500 BC. In this pre-Christian era, Druids acted as judges, doctors, diviners, sages, mystics, and clerical scholars. They were considered amongst the wisest and most respected members of Celtic society. The name Druid itself is connected with the Celtic word for ‘oak tree’. 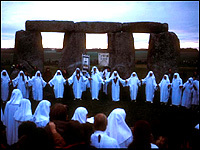 There are around 10,000 practising Druids in Britain with Druid orders being spread around the country. These Druid orders meet up regularly and continue the traditions of reading Celtic poetry, while dressed in robes and wearing ancient Celtic symbols. There are three sets of people who Druids hold in exceptional honour – the bards, the ovates and the druids. The bards are singers and poets, and the keepers of tradition. The ovates are diviners and natural philosophers. The Druids are learned in natural and moral philosophy. Each of the three groups has specific tasks and jobs to perform. 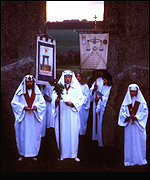 In 1989 the Council of British Druid Orders was formed with two or three founding member orders. There are now twelve major orders all over the United Kingdom. 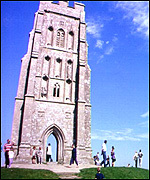 The Glastonbury Order of Druids is thousands of years old with its roots in antiquity. There is evidence of early Druid activity in the giant earthworks south of Glastonbury Tor – known as Glastonbury Zodiac – which date back to 2770 BC. Druids are believers in reincarnation. They believe that the soul is immortal and after a person dies, they are transported to the ‘Otherworld’. They also believe that that person will come back again in another human body. Some put the growing interest in Druidism over the past decade down to the fact that spiritual concerns are once again coming to the fore in society. There is also growing interest in the environment and the myths and legends of England. This philosophy has proved attractive to a growing number of New Age travellers in the British countryside. The traditional meeting place of the Druids is Stonehenge which is pre-dates Druidism. 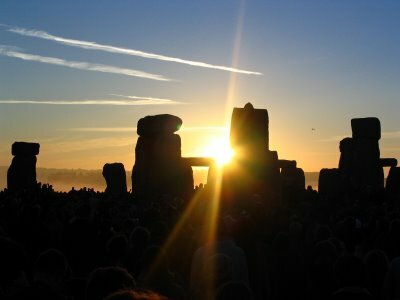 Druids claim that their religion has marked the summer solstice at Stonehenge for nearly 800 years. Today’s Druids form their traditional circle around the stones every June, with the conch shell sounding to herald a new dawn and new season. The Glastonbury Druids joined their colleagues in this celebration once again this year. A DEVELOPER has been ordered by a judge to demolish a Stonehenge-like structure on Achill Island, Co Mayo. (41), with addresses at Achill Island, Co Mayo and Salthill, Co Galway, to restore the site to its original state if An Bord Pleanala finds that it is not an exempted development. The orders had been sought by Mayo County Council, which says the structure is an unauthorised development. It consists of a ring with 30 large columns, with tapping stones placed on top. Mr McNamara had applied to An Bord Pleanala to have the structure deemed an exempted development. The judge agreed toput a stay on his order until An Bord Pleanala has made its decision. Mr McNamara was dubbed the ‘Anglo Avenger’ when he hit the headlines last year after driving a cement lorry emblazoned with the words “Anglo” and “toxic bank” to the gates of Leinster House. Stonehenge is one of the most mystifying and fascinating attractions you are likely to unearth in your lifetime. Solstice, or Litha is defined as a stopping or standing still of the sun. It is the longest day of the year and the time when the sun is at its highest elevation. This date has held sacred import for thousands of years as humans have unfailingly been astounded by the immense life-giving force of the sun. The Celts commemorated it with bonfires that supplemented the sun’s energy, Christians celebrated the feast of St John the Baptist towards the end of June and the Chinese commemorated the Summer Solstice with the festival of Li, the Goddess of light. Celebrators characteristically congregate at Stonehenge, the archaic stone circle in Wiltshire, to see the sun rise. The Heel Stone and Slaughter Stone, positioned outside the main circle, align with the rising sun. Intriguingly, Summer Solstice revelers used to number, incredibly enough, in the region of 70,000. In 1985 they conflicted with up to 500 police in the notorious ‘Battle of the Beanfield’. 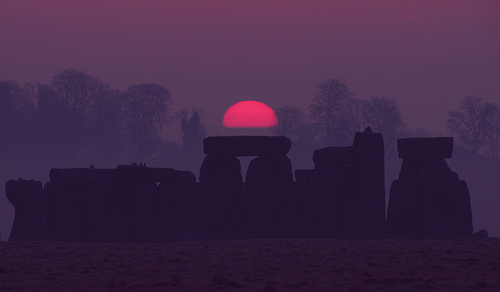 For many the wish to get to Stonehenge in time for the Solstice is analogous to a sacred experience. Take a Stonehenge tour and savour the most powerfully spiritual experience you are very likely to have. Stonehenge was deemed a World Heritage Site in 1986 and still maintains its deeply sacred and unearthly feel, in spite of the great number of tourists who visit. If you decide to visit this remarkable site during the Summer Solstice, you are making an altogether very wise decision. However, you should also make certain you also spend some time exploring into the enchanting regions that are in close proximity to Stonehenge. Indeed, if it is spirituality you are looking for, do not limit your tour to the Summer Solstice at Stonehenge. Stonehenge is not the only antique landmark in this area. Indeed, just 25 miles north of Stonehenge is the striking Avebury complex, which is a vigorous competitor to be the most impressive of all the remaining antediluvian earthworks in Europe. The Avebury stone circle is truly much better than that of Stonehenge – but the stones are slighter. Upon visiting Avebury, you can touch its stones, which you are not able to do at Stonehenge. Windsor Castle is certainly well worth visiting. Indeed, it is not for naught that Samuel Pepys avowed the Castle to be ‘the most romantic castle that is in the world’. That was in 1666 – however, it is a true today as it ever was. In 43 AD the Romans began the creation of ‘Aquae Sulis’, the Roman Baths, as a refuge affording tranquillity and relaxation, distinct from other Roman defensive town settlements. Take a Stonehenge and Windsor tour for an especially captivating experience that will leave you with lasting memories.